Telepath Adam is recovering from injuries sustained in previous story SHARP and trying to repair his relationships with the officers at Atlanta PD. Then his ex rings, begging for his help – her uncle is dead and the Guild is claiming suicide. Adam returns to the place that threw him out after getting him addicted to drug Satin, and is promptly drawn into a muddy mixture of politics and possible health scare. There’s a possibility that Kara’s uncle was suffering from madness, which is a highly contagious disease amongst telepaths, and the Guild needs to get a hold on the situation stat. Not to mention Cherabino’s investigation of a murder that’s probably the work of a criminal mastermind. MARKED builds well on previous novels, with Adam’s relationship with Isabella Cherabino blossoming further, and his sponsor Swartz still recovering from a near-fatal heart attack. The mysterious Guild, only really alluded to in CLEAN and SHARP, is in full play here… and it’s not a nice organisation in the slightest. 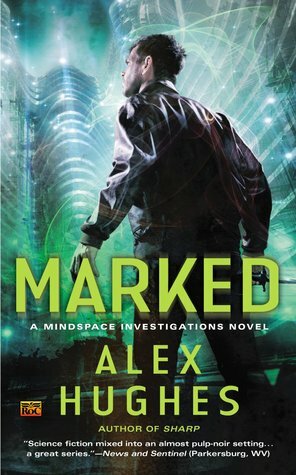 MARKED is the third book in Alex Hughes’ Mindspace Investigations series, and is her best yet. I can’t wait to read Marked. I love this series. Met Alex at coastal Magic in Feb. She is super nice, too.